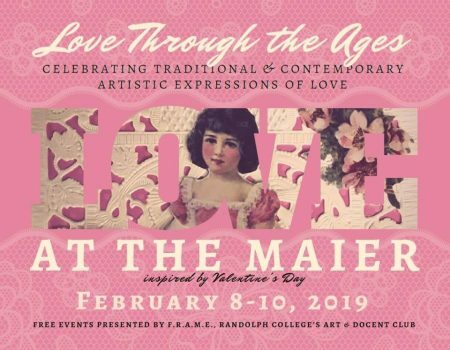 The Maier Museum of Art at Randolph College will help its patrons and the College community get in the Valentine’s Day spirit with a series of romantic and family activities at the 16th Annual Love at the Maier this weekend, Feb. 8-10. The theme is “Love Through the Ages,” and the complete schedule is listed below. For more information, visit www.maiermuseum.org. Friday, February 8, 5:30 p.m. Celebrate traditional and contemporary artistic expressions of love! Local historian Mary Kathryn McIntosh will discuss the history of valentines, followed by a presentation by members of FRAME, Randolph College’s student docent club, on works from the College’s art collection. Enjoy hors d’oeuvres and a cash bar (beer/wine). Free. Friends and lovers have been exchanging valentines for centuries! Led by local historian, Mary Kathryn McIntosh, explore the intricate artistry and hidden messages contained in vintage valentines and learn to make your own Victorian-style cards. Authentic valentines from her private collection will be on display. McIntosh is a College of William and Mary graduate who presents both lectures and workshops on early Christmas and Valentine history. Participants must be 16 years and up. All supplies included. Light refreshments provided. Sunday, February 10, 2–4 p.m.
Art-making activities inspired by our spring exhibitions that will make your heart swoon! Led by FRAME, Randolph College’s student docent club. For ages 5+ with an adult. Free.